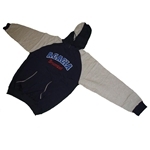 100% top quality polyester fabric, straight leg design without any padding for extra comfort. 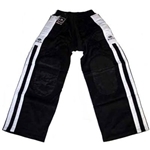 Elastic waist with drawstring ensures a secure fit. Pants are fairly thin making them lightweight and breathable. Will fit tall people well as the leg length is long. Pocket on back right side. 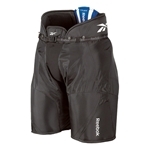 Pants will stretch some, allowing knee and shin pads to snuggly fit under the pant leg. They DO NOT have reinforced knees. 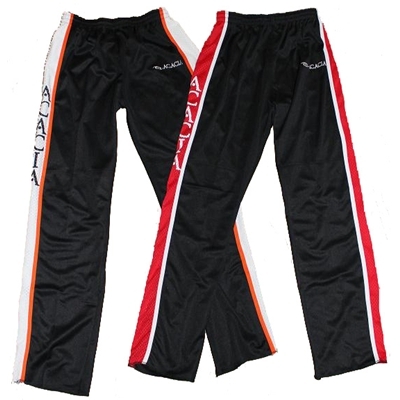 If you need a tougher pant, we would recommend the Acacia® "Pro Broom" Broomball Pant. 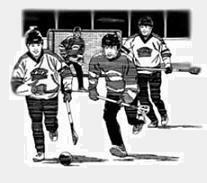 Specially designed for broomball, hockey and other contact sports. Made in Pakistan. Adult Small 28"-30" 32" 42"
Adult Medium 31"-33" 33" 43"
Adult Large 34"-36" 34" 44"
Adult XL 37"-39" 35" 45"
Adult XXL 40"-42" 36" 46"